For the 12th straight year I’ve made a list of the video games I’ve played in the past 12 months. 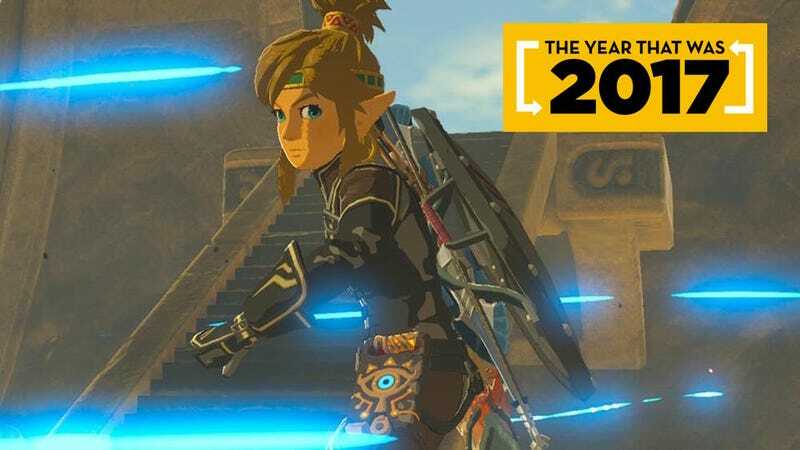 I’ve tweaked the way I’ve made this list as my gaming habits have changed, but the biggest impact I expected to see this year was from becoming a father. I was right, but 2017 threw a second big surprise at me, too. First, a brief note about how I’ve changed my approach to the list: I still divide things up by platforms and I still list all the games I started. I used to only have to do that because I tended to not return to games I hadn’t played a lot of in the previous year and I just never returned to a game without finishing it. That’s been changing as I dip in and out of games, though my bias for single-player games still means I wind up finishing games at some point. You won’t see unfinishable multiplayer games on my list very often. My tastes run more Mario than Mario Kart, more Assassin’s Creed than Overwatch. I mostly keep this list for me, having started it in 2006, but I publish it as a conversation starter and as a way for people who follow my work to see what games I’m taking in. Maybe you’ll see a blind spot you can point out or maybe you’ll have a question about a game I’ve played. This year I think I can also shed some light on the impact of playing games while juggling twins. I rarely have time to play games at work, so I’ve long depended on being able to play during nights and weekends. I knew that’d change once I became a dad. My kids were born in the waning hours of 2016, and I spent 2017 learning what it’s like to love games but love two babies a whole lot more. I predicted that fatherhood would retire my 2016 interest in trying VR games. It did. My home is small, and there is no room to make a VR set-up that isn’t going to be trampled by crawling twins. More importantly, I wasn’t going to put VR on and not be able to hear or see my kids. I also put a hold on dabbling with the occasional multiplayer game, as stuff I can’t pause is mostly a no-go. I could not have predicted that I’d play and enjoy a brutal game like Nioh in any year, to say nothing of the year I had new baby twins. It’s hard to even pause Nioh, but I somehow figured out how to play this game patiently during naps and after bedtime and with enough savvy to know how to get out of danger when the babies woke up and needed my attention. In the first month of 2017 I played some portable games but wouldn’t turn on any PC or console games while they were awake or when they were asleep, because I needed to follow suit. As they began to sleep better, I started playing games on my TV from 8pm-10pm, eventually stretching those sessions to 11pm. That gave me just enough time to get a good night’s sleep and maybe even get up at 5:30am for a run before the kids got up. As I returned to work, my half-hour commutes gave me an added hour to play. That was occupied with 3DS games and then eventually a whole lot of Switch. I expected the kids to change my gaming, but I didn’t expect that 2017 would be the year of playing epic-length games. I’m not sure if the two are connected, but as the year went on I found that, yes, I played fewer games, but the games I played, I played longer. I think this is a fluke due to the extraordinary size of a handful of games that grabbed my attention. I went 70+ hours with Horizon Zero Dawn and Nioh and my Switch tells me I’ve gone 125+ hours with Breath of the Wild. I hadn’t played any game this long since I spent 65 hours playing through Suikoden V in 2006, the year I first started making these lists. I also almost fit a fourth epic into the year. I’m 45 hours into the massive Assassin’s Creed Origins and will likely hit 70 hours by the time I’ve gone through it in 2018. Anyway, on with the list. As noted, this year’s list includes a lot of games I started, a small number from previous years that I finished and a small number from previous years that I played more of but didn’t wrap up. Fire Emblem Fates: Birthright - I can no longer keep up with the Fire Emblem games, a series I’ve devoured on GBA, DS, GameCube and Wii. I played the 3DS’ Awakening for 50 hours in 2013 but never finished Fates: Birthright, and then decided to bail to play Echoes which then lost out, like so many other 3DS games, to my prioritization of playing the Switch during my commutes. Echoes seemed neat, but I am stumbling to keep up and should probably just take a franchise breather until a proper sequel hits the Switch. Kirby Triple Deluxe - I started this 2014 Kirby game years ago and got back to it this year as I’ve become a fan of this series’ mix of spectacle, creative level design and untaxing gameplay. I’ve learned that playing any Kirby sidescroller is best done with the intent to find all of its hidden collectibles. You get the kind of pleasing level design discoveries that others were finding this year with Super Mario Odyssey. Triple Deluxe is best played with the 3DS’ 3D on as its title signals that the designers tried hard to give the game’s visuals impressive depth. Layton’s Mystery Journey -I love Layton games but just couldn’t make the time to play much of this one. The Legend of Zelda: Link’s Awakening DX - I’d played all non CD-i Zelda games except this one and started it right before Breath of the Wild came out. It’s very cool, as you may have heard, though I’m only a few dungeons in. Mario & Luigi: Superstar Saga + Bowser’s Minions - Same deal as the Fire Emblem games. I can’t keep up! I’m still playing its predecessor Paper Jam in fits and starts and was planning to skip the remade Superstar Saga here and focus on its b-side, the all-new Bowser’s Minions side game. Too bad you’re forced to play two hours of SS to unlock BM and that the gameplay of BM initially seems shallow. I hope it gets better, as I like the idea of finally playing a game from the perspective of Mario’s enemies. Metroid Samus Returns - I’m only a couple of hours into this, despite my clamoring for years for a new Metroid game. This is really well-made, but the allure of the Switch and the fact that this is a remake that apparently lacks a Metroid: Zero Mission-style twist has tempered my interest. I am impressed with what I’ve played, though, and do plan to get back to it when my Switch isn’t dominating my portable gaming time. Monster Hunter Stories - I only played this for nine minutes. Should I play more? Star Fox Command - I went back to this DS game to play through more of its possible timelines after sampling its spiritual predecessor, Star Fox 2, on the SNES classic. This game remains terrific. Tokyo Crash Mobs - Old game. Finally tried it. Universal Paperclips - My iOS gaming was dreadful this year, as I focused my portable gaming time on Switch and 3DS, but my weakness for pointless clicker games thankfully got me hooked on designer Frank Lantz’s iteration about paperclips. This clicker rewards actually strategic play, so for once I didn’t hate myself for playing one. I’ve known Lantz for a long time and it was neat to see a game he released out of the blue—initially for browsers—swallow my and many colleagues’ and friends’ attention for a week or so. Blasters of the Universe - This is an Oculus Rift VR game I tried near the end of the year while downloading the much-lauded Lone Echo, which is supposedly the VR game to play. Sadly, Lone Echo wouldn’t load, I then needed to break down the VR set-up so that the kids would be able to crawl freely in the living room the next morning and I’ve still not had a chance to give it another shot. Dead Hungry - Leave it to Q Games to make a good VR game. They generally make good stuff. Doki Doki Literature Club - I played a tiny bit for our end-of-year game-of-the-year discussions. Not a fan of visual novels and didn’t even get to the twist, though I heard about it and it sounds great. Fortnite: Battle Royale - I squeaked this in on New Year’s after watching my nephew play. I only got one session in and scored a whopping 45th place. The game seems like a lot of fun, but who am I to recommend a game I played once and not very well? Total War: Warhammer 2 - I started this since Luke Plunkett told me it was great. It probably is, but I only gave it an hour. It is not made to be played by a casual PC gamer like me who plays his PC games off of the living room TV and has the gradually failing vision of a 41-year-old man. I would have probably hit 60 or 70 hours in Assassin’s Creed Origins, too, if not for a number of other end-of-year gaming distractions. Dino Frontier - One of the best PS VR games. Echo - I want to like it, but it starts so slowly. In the two hours I played in late December, It was just getting to its interesting twist on stealth game mechanics. I just haven’t played enough to recommend it. For Honor - Barely played it but plan to go back to the campaign at least… bad idea? Horizon Zero Dawn - Beautiful game, excellent combat, strong writing, great lore collectibles and a terrific year-end expansion. My second favorite game of the year behind Zelda. Knack II - This game is very good. I’m not kidding. It’s a throwback to the great mascot games of the PS2 and is as fun to play and as full of pleasing level designs and power-ups as the best of the Ratchet & Clanks and Sly Coopers. Middle-Earth: Shadow of War - I’m 20 or so hours in and really enjoy the combat system and the incredible combat animations, but what a dreary game world, what boring quests and what squandered potential given the blueprint of Shadow of Mordor. Nier Automata - I’m just a few hours into this, having neglected it most of the year. My colleagues rave about it. Hopefully it’ll click with me, but so far it feels uneven and I’m just not sold yet. Nioh - My third favorite game of the year and one I’ve played for over 70 hours. I never got sucked into a Souls game and nearly bailed on Nioh while struggling through its first level set in Japan. I’m not sure why I stuck with it, but in doing so, I learned to appreciate the allure of a brutally hard game designed for patient, observant play. I learned the beauty of Nioh’s complex stance-based combat system. I learned the pain of a game that makes falling into water instant death and then sets one of its levels on a set of narrow docks. I learned the wonder of slowly getting better at a game like this and I learned the immense frustration of finishing a game, buying its three expansions and then discovering that, no, the expansions are so viciously difficult that they expect you to grind through replays of the campaign to even access the new stuff. That last discovery was a bitter twist to one of the most challenging but rewarding game journeys I’ve ever taken. Patapon Remastered - I love Patapon, but I’m not into playing PSP games blown up on my TV screen. Pyre - I really liked Bastion and Transistor and expected to be into Pyre, but my interest in the game faded during what I’m told is its slow, extended start. Given the amount of reading in this game, you know which system I’d rather play it on? Star Trek Bridge Crew - Didn’t play a ton of it, but played enough to be glad that someone thought it’d be cool to let you play the Kobayashi Maru in first-person virtual reality from the captain’s chair. Sundered - Liked the little bit of it I played but I haven’t played enough to recommend it. Uncharted Lost Legacy - Whoa. Best Uncharted game? Could be! I stretched this one across two weeks and had a wonderful time from start to finish. Yakuza 0 - Haven’t played enough to assess. Note: To a lesser degree than it has on the Switch (see below), my PS4 backlog has been growing, too. Here are the 2017 games I got but haven’t started yet: Children of the Zodiarcs, Destiny 2, Doom VFR, Final Fantasy XII: The Zodiac Age, Gravity Rush 2, Jak 1-3 (Somehow I played the Ratchets and the Slys but never these PS2 games), Just Cause 3, What Remains of Edith Finch. Star Fox 2 - I’m a sucker for messy, ambitious, mold-breaking games. See Assassin’s Creed III. See this game. Axiom Verge - I started this on PS4 years ago and bounced off it quickly. I tried it on Switch this time. I was enjoying it but got distracted by other things. I can’t say I’ve played enough to recommend it, though I’m pleased with it so far. Doom - I’d started it on PC last year and was about four levels in when the kids were born. I assumed I wouldn’t get back to my PC save for years. Little did I know that in under a year I’d be playing it on the subway on a handheld. Incredible. And what a great game. It features thrilling movement-centric shootouts and is filled wonderfully hidden secrets that encourage a bit of the kind of first-person exploration I loved in the Metroid Primes. The Legend of Zelda: Breath of the Wild - My favorite game of the year. Lego City Undercover - Finished it on Wii U years ago. Enjoyed being able to play it with somewhat better load times on Switch. The Lego Ninjago Movie Video Game - From what I’ve played so far, the most innovative Lego game in years with a new less grind-focused approach to playing through levels and a radically improved combat system. Just a shame that I don’t care about the Ninjago trappings at all. Mighty Gunvolt Burst - Like Mega Man, except you craft your own gun using power-ups you acquire as you play. SteamWorld Dig 2 - I hear it’s amazing, but I’ve played less than an hour and can’t yet confirm. Xenoblade Chronicles 2 - I got to the first town, so I still can’t say if I’m more Tim Rogers or Jason Schreier about this game. Gears of War 4 - I finally started the campaign but drifted away from it quickly. I’ll go back and finish eventually, just to play through what happens. I’ve enjoyed the previous game’s campaigns and will likely try the inevitable sequel. Path of Exile - I hear it’s great, but I didn’t play much. Mass Effect: Andromeda - Only played a couple of hours. I hear people were let down by this one. Prey - I’m not that far into it, but I really like the game’s world and how rewarding it’s been to explore. I hear the game drags near the end, so player beware. The Division - I thought I was done with this game after playing a few dozen hours of it last year. Nope. played a lot more this year thanks to the game’s good 1.7 update that added the innovative global events system and thanks even more to the incredible 1.8 update that finally catered to my interest in getting more good PvE content in the game. Wolfenstein II: The New Colossus -I’m only one level in so can’t yet recommend it one way or the other. Yooka-Laylee - I love the Banjo Kazooie games but only played this spiritual successor for about an hour before deciding to wait for the Switch version… which is now part of my long backlog on that system. Note: My Xbox One backlog is pretty small. Just Cuphead and Phantom Dust. The Legend of Zelda: Twilight Princess HD - I finished the original Wii version of this game when it came out in 2006 and then played a tiny bit of this HD re-release last year. I started over and put a dozen more hours into it as I was awaiting Breath of the Wild for Switch. I was thrilled to go back to this relatively unloved Zelda game and re-experience a lot of it for the first time since I played through it over a decade ago. But then the new Zelda came and so much for that. Note: According to my Wii U play log, I also ran Xenoblade Chronicles X for half an hour in mid-June. I don’t recall playing it, but vaguely remembering checking to see how something worked. Can’t remember what it even was, so I’m not count it. I also briefly ran Breath of the Wild on Wii U to see how it looked and how its digital instruction manual worked. And that was it for the Wii U. Well, that’s a lot more games than I thought I’d be able to play while juggling baby twins all year. The final 2017 tally is: 106 games played. That’s my lowest total since I started this list with 102 in the year 2006 and far from my ludicrous 2016 peak of 269. That said, I’d have thought the kids would be the reason for the fall-off, though I now suspect that the 300 hours I spent on just four games (Zelda, Nioh, Horizon, and Assassin’s Creed) are as much a culprit. What a year! I hope your year was full of interesting games. If there’s stuff I missed that I just have to play, let me know. Correction - 2pm: I had originally counted my tally as 104 games due to a typographical error. Sorry about that. But at least Ever Oasis is now part of the official count. Too bad it wasn’t that good. Update - 3:10pm: The horror! I forgot all about the Wii U. One game added to correct the record. Poor Wii U. It just never was quite good enough.